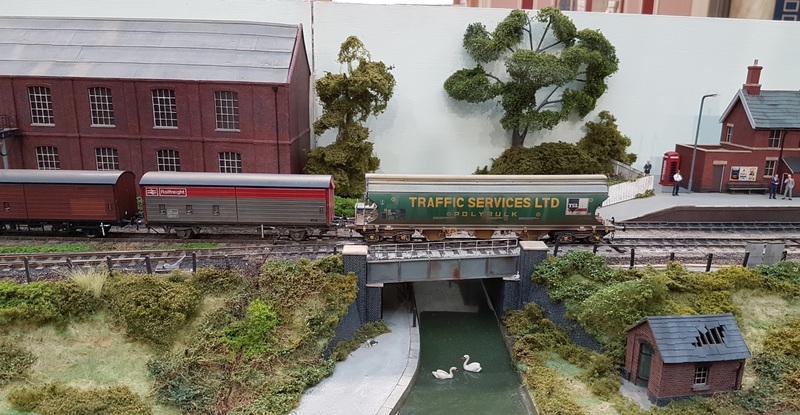 Last Saturday it was my annual pilgrimage to the London Festival of Railway Modelling at Alexandra Palace. As usual, I went with my ex-work colleague Malcolm (unfortunately Peter can’t make it up the hill from the station these days.) It’s a simple journey from Redhill to north London – train to Victoria, Victoria line underground to Finsbury Park, then three stops on the Kings Cross suburban lines to Ally Pally. And lastly the long haul for 1/2 a mile up the hill to the Palace. 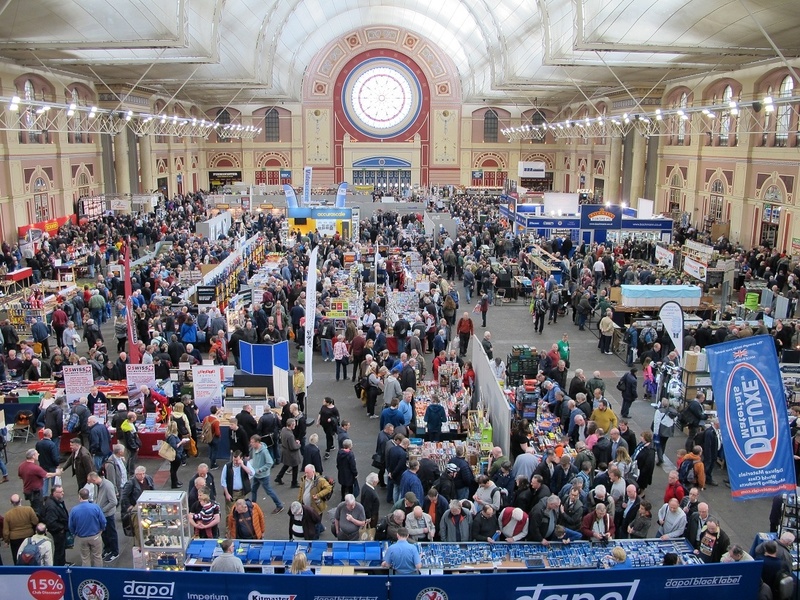 I do like Alexandra Palace as a venue, as it’s light and airy, with plenty of room between the exhibits. 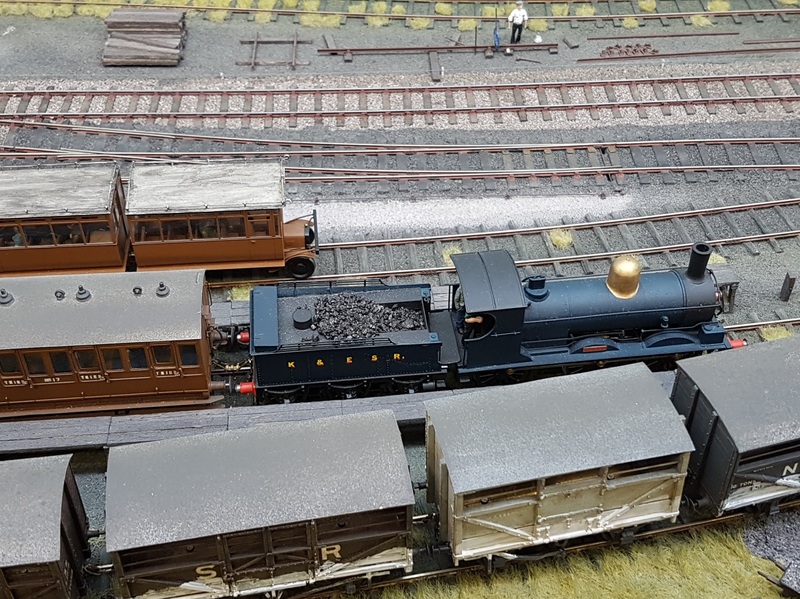 Although some of the layouts on display were ‘old friends’, there is always something excellent to look at. And I enjoyed running into a number of other friends, in front of or behind the exhibits. This picture culled from RMWeb gives the idea. It makes an interesting contrast to the shed of the Stuttgart halls. I was on my best behaviour, and didn’t buy much at all. Really, there was not much there I actually wanted, let alone needed, so I kept my money for the expensive catering. I enjoyed my pint and pasty, despite not recognising that I had been given a chicken rather than cheese and onion pasty till I was half way through it. So here are (most of) the layouts on display, in no particular order. Fenchurch St Peter in (OO) captures the air of a secondary line somewhere in the Fens. The warehouse buildings remind me of childhood holidays in East Dereham and Norwich. Putnam (HO) is inspired by the New York Central Railroad, near New York. 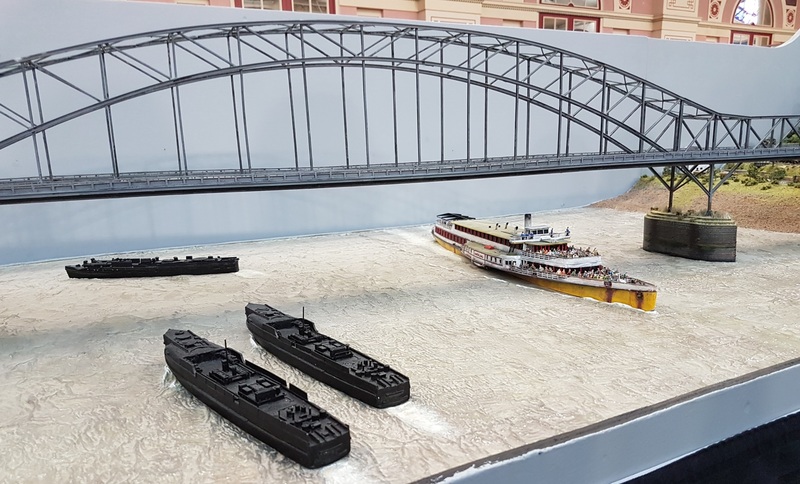 The Bridge at Remagen (N) is a true scale model of the Ludenorff bridge over the Rhine. 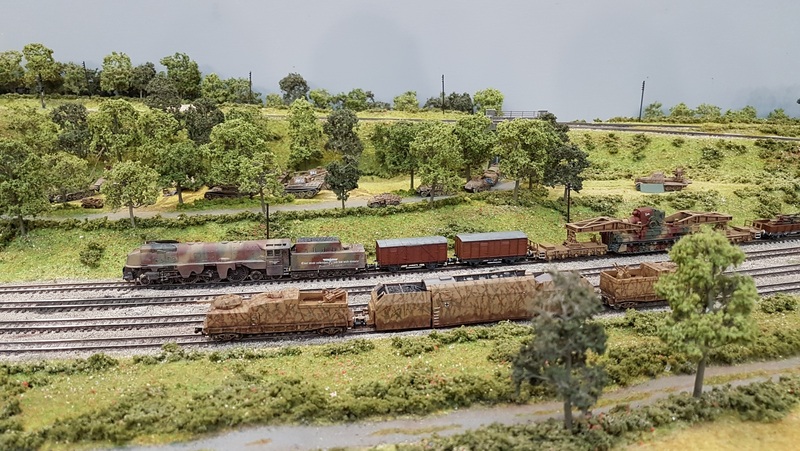 The scenery is expansive, but it is also unusual in being set in 1944, with armoured trains and plenty of German tanks on the move by rail. 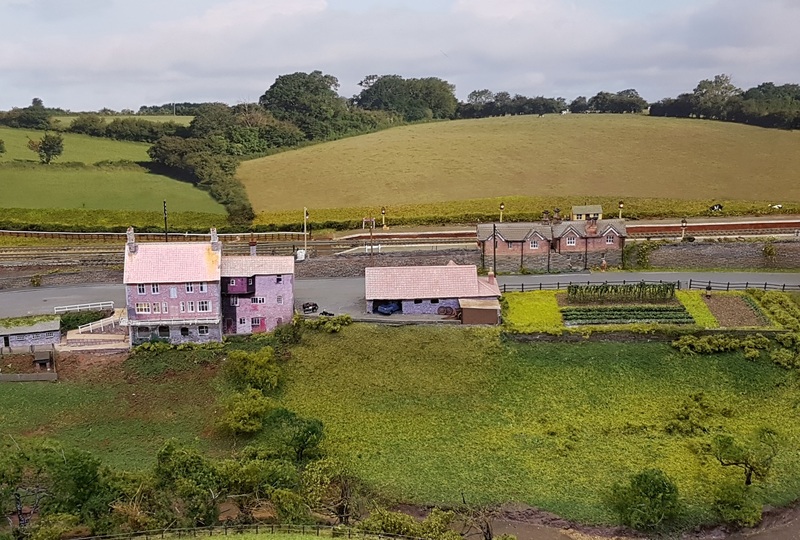 I have heard of layouts showing ‘trains in the landscape’, but this takes it to a new level – trains difficult to spot in the landscape due to the camouflage. Kayreuth is also set in Germany, but is dated around the millennium. 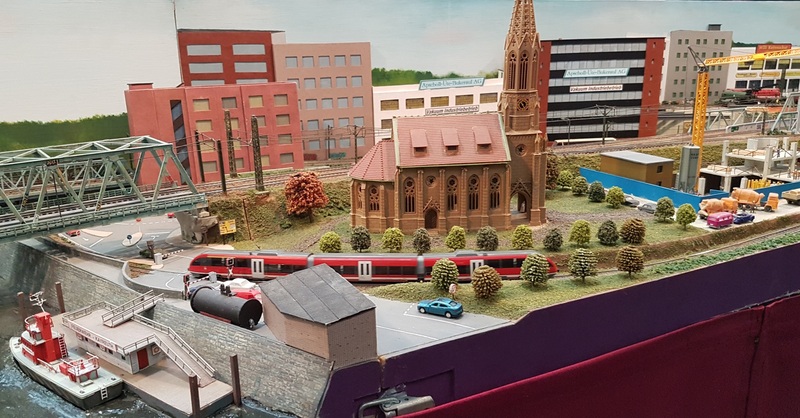 Always plenty of action on this well detailed urban layout. Changing continent, and pace, Megantic (On2) is based on the Maine 2ft narrow gauge system, an attractive prototype less well known than the Colorado 3ft lines. Another old friend is Ian Lampkin’s Santa Barbara (N). A near scale model of this BNSF station in California, it’s good for trainspotting! 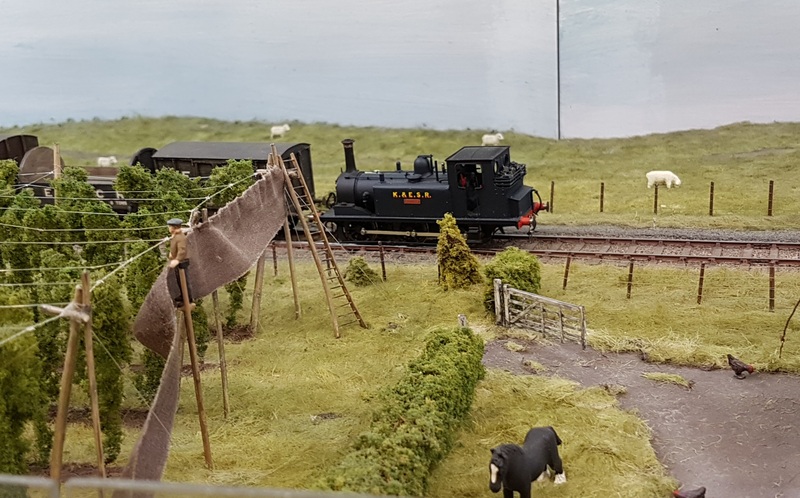 Ian seems to be ubiquitous at shows, and is bringing his Banbury layout to our N Gauge SouthEast exhibition. Lower Exbury (P4) might be described as small but perfectly formed. 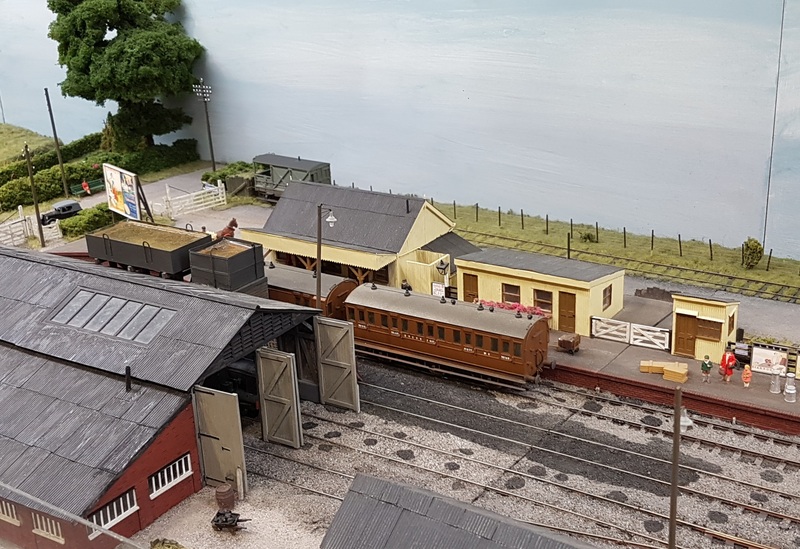 I’ve seen this little Hampshire light railway in BR days an number of times, but the details are always worth another look. I was amused that Alison Barker, the operator, was dressed in a 1950’s outfit that match the lady standing on the station platform. I then forgot to get myself 3-D scanned at the Modelu stand – I was not intending to wear a polka dotted skirt, I hasten to add…..
A quiet moment at Oldshaw (EM). And a quieter moment at Wickwar (N). I think they were having a few electrical problems! Finally today, Rolvendon K&ESR (P4). A another lovely bit of light railway, thanks to Colonel Stephens. The old ‘Ilfracombe Goods’ 0-6-0 in the third photograph has always been a favourite locomotive.